As Lotus specialists we offer the full Lotus service schedule as well as interim oil, coolant and brake fluid services – ideal for the road user or track day driver wanting to keep their car in top condition all year round. Using the same servicing routines, techniques and specialist tools as specified by Lotus Cars we can make sure you get the very best from your vehicle. With genuine parts and high performance lubricants applied by trained technicians, we can service, maintain and repair your Lotus without damaging your Lotus warranty. With many years of experience behind us we can extend all our services to cover many additional aspects that we consider to be essential additions to the normal service schedule. Some of these areas are listed below. Call or email us with your specific requirements. Aside from our standard range of services we also carry out performance upgrades and vehicle setup for road, track or race specification. See our PERFORMANCE section for more details of what we can offer while your vehicle is with us for routine servicing or repairs. If you are travelling to us we can take you to nearby Woodbridge or Ipswich town centre. Alternatively our customer lounge is equipped with wireless internet connectivity, the latest offerings from the motoring press, ipod dock, LCD DVD TV and of course – complimentary tea and coffee. Waldringfield Heath Golf Club is a two-minute walk away where clubs are available to hire. There are many footpaths to the rivers Deben and Orwell within 2 minutes walk of our workshops – so there are lots of things to keep you occupied if you’re only stopping with us for a day. If you are planning more extensive work on your vehicle, we can collect and deliver your vehicle. Our European visitors often seek local accommodation which we can help arrange for you if required. As owners and enthusiasts, we pride ourselves on our attention to detail and friendly approach to customer service. 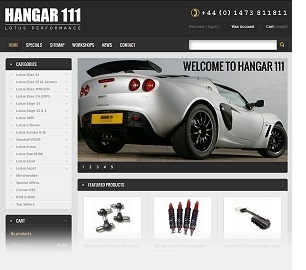 When you buy from Hangar 111, you will be getting a product or a service that we have gone to great lengths to ensure will delight you. For details about the services we can provide for your Lotus please call or contact us.